Place salmon fillets in lightly greased baking dish. Combine olive oil, lemon juice, garlic, parsley, basil, salt and pepper; pour over salmon. Bake for about 20 minutes or until fish flakes easily. 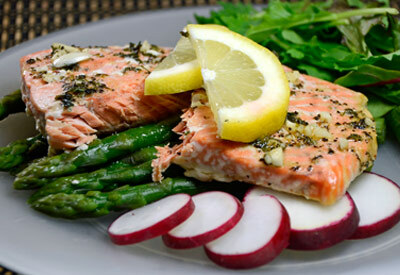 To serve, place radish slices and cooked asparagus on each plate; top with salmon fillets. Add mixed greens and lemon slices.